While opossums play a vital role in eliminating rodents, snakes, insects, and carrion in urban environments, their opportunistic behaviors create many problems for homeowners. The available food sources and shelter your home provides keeps these nuisance pests hanging around, giving them the opportunity to rummage through your garbage cans, steal your pet’s food, and create a mess inside of your attic. If proper opossum control methods are not quickly implemented, you are putting yourself at risk to deal with larger damages, repair costs, and health concerns. Therefore, if you’re facing opossum issues on your property, it’s important you call the professionals at Critter Control® of Orlando as soon as possible. Because opossums are scavengers, they will go to great lengths to get their next meal. This means climbing into your outside trash cans, often getting themselves stuck because the inside is too slippery to climb back up. And, those that are successful in tipping over your garbage cans make a mess by spreading your trash all over your driveway. Opossums often destroy your yard and landscaping by consuming garden vegetables and tree fruits and feeding on the food scraps in your compost piles. They also love the easy access to the pet food you leave in dishes outside. Should an opossum enter your home, they can climb into insulation beneath your floor or travel inside of your ductwork. They seek shelter within attics to protect themselves from outside predators and elements, especially when preparing to give birth. Once they’re inside your attic, they will use your insulation to build a nest, chew on the wood and drywall, gnaw on electrical wiring, and leave a substantial amount of waste behind. The best way to keep opossums from coming onto your property is by eliminating food sources and keeping up with your home maintenance. Keep garbage cans inside until trash day or buy trashcans that have secure lids. Seal any holes or entry points that allow animals to access inside. Pick up any rotting fruit or vegetables, clean up compost piles, and avoid leaving pet food outside. When you’re faced with opossum problems, rely on the experts at Critter Control® of Orlando. 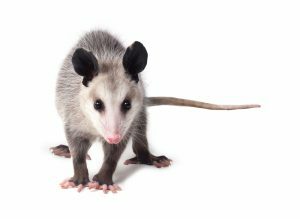 Our technicians will safely and humanely remove the nuisance wildlife, clean up any messes, and repair damages created by the opossums. To receive a free estimate, or to learn more about our animal control services, give us a call at 407-295-7194.